These Kyoto tours include city tours, walking tours, cycling tours, dinner and cultural experiences. Kyoto was the capital of Japan from 794 to 1868. Immerse yourself in the history of Japan as you visit three of the most famous and beautiful sights in Kyoto. Nijo Castle, built in 1603, was where the emperor was restored to power in 1867. The stunning Golden Pavilion, Kinkakuji Temple, is a treasure of Japan. 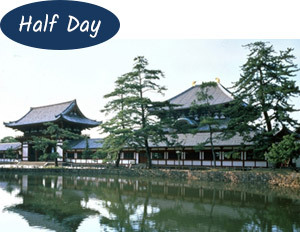 Experience the ancient history of the Imperial Palace, built at the beginning of the Heian period in 794. 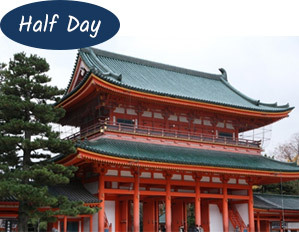 Visit some of the most popular and exquisite landmarks in Kyoto on this afternoon tour. Amble through Fushimi Inari Taisha, the head shrine of Inari Shrines throughout Japan and one of Japan’s oldest and most important Shinto shrines. You’ll be captivated by the thousands of vermillion torii gates. Browse through specialty shops on the slopes up to Kiyomizudera Temple, an excellent location to enjoy the beauty of nature in all four seasons. About 1,300 years ago, Nara was the capital of Japan. Visit the world’s largest wooden structure, Todaiji Temple, and see Japan’s largest statue of Buddha in its main hall (Daibutsuden). Walk through Nara Park, among the 1,200 tame deer roaming the extensive parklands. Deer were once considered messengers of the Gods. Continue to Kasuga Taisha Shrine, the most celebrated and largest shrine in Nara. 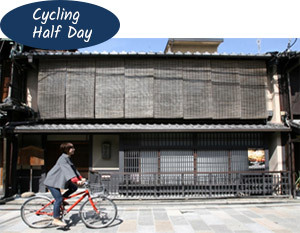 Hop on a bicycle for a cycling excursion through ancient city Kyoto. Take the back streets, the alleys and the stone paths to discover new sights of Japan and new things about Kyoto which cannot be seen on a bus or walking tours. This guided cycling tour takes you back to the Kyoto of the past where you can imagine being part of the history of Japan. Take a private, guided bicycle tour of the best of Kyoto. Your English-speaking guide will lead you at a comfortable pace. You will discover new sights of Japan and new things about Kyoto which cannot be seen on a bus or walking tour. The places visited are dependant on the tour chosen. This tour offers many ways to experience Kyoto’s culture and tradition. Visit Kenninji Temple, the oldest Zen temple in Kyoto. Enjoy a stroll around Gion, then experience first-hand Japanese culture at its most elegant with an authentic tea ceremony. After the tea ceremony, walk around Nishiki Market, Kyoto’s kitchen. Experience Kyoto, the former capital of Japan from 794 to 1868. 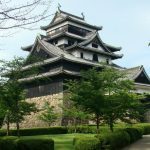 Learn about its 1,200 year past and immerse yourself in the history of ancient Japan. 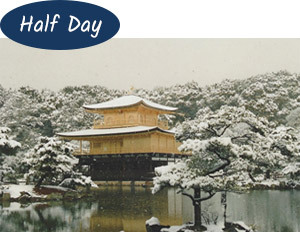 Visit the most famous and beautiful sights in Kyoto, the world heritage listed sites of Kinkakuji Temple and Nijo Castle. 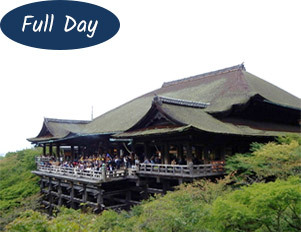 See the marvellous wooden structure of Kiyomizudera and the amazing, hand-carved wooden statues at Sanjusangendo Temple. Stroll around the Kyoto Imperial Palace and Fushimi Inari Taisha, one of Japan’s oldest and most important Shinto shrines. Lunch is also provided. Discover the must-see sights in Japan’s two ancient capital cities, Kyoto and Nara. 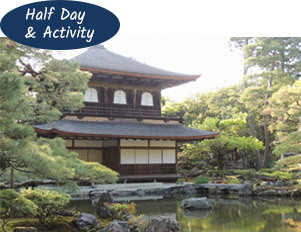 See the rich history of samurai and emperors at Nijo Castle and Kyoto Imperial Palace. The incredible, pure gold leaf covered Golden Pavilion will take your breath away. 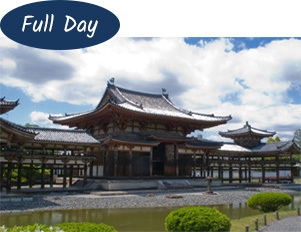 Visit Todaiji Temple and see Japan’s largest statue of Buddha housed in the world’s largest wooden structure. Walk with the deer of Nara Park and then admire the 3,000 stone and bronze lanterns at Kasuga Taisha Shrine, the most celebrated shrine in Nara. Visit the picturesque area around Ujibashi Bridge and the intricately designed Byodoin Temple and relax with a simple tea ceremony. Uji is famous for its green tea, known as “Uji-cha”. 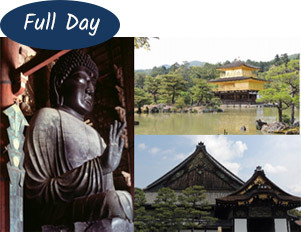 After lunch, visit Todaiji Temple and see Japan’s largest statue of Buddha in the world’s largest wooden structure. Walk through Nara Park with the deer, and admire the 3,000 stone and bronze lanterns at Kasuga Taisha Shrine, the most celebrated shrine in Nara. A Maiko is an apprentice Geisha. 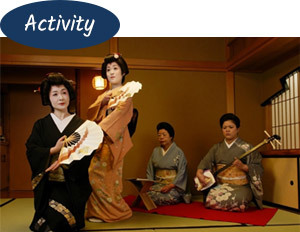 This tour allows you to participate in an authentic experience of a traditional Maiko dance and traditional Japanese games played together with the Maiko. Be the envy of your friends as you take the opportunity to pose with the Maiko for a much sought-after commemorative photo. You will relish the experience of Japanese culture and cuisine. If you love Japanese food, why not take a cooking lesson from a local Japanese teacher. 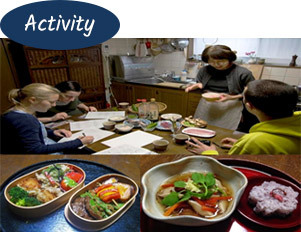 Learn more about Japanese food and the ingredients, then you can start cooking authentic Japanese meals at home. Delight in the friendly, pleasant atmosphere and then feast on the genuine Japanese meal that you cooked! Contents: Authentic Japanese meal cooking lesson. Have you already been to Kyoto? Or want to get around in a more relaxed and efficient way. 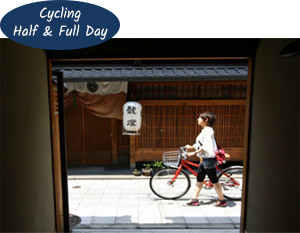 Why don’t you use a rental bicycle and explore a wider range of attractions in Kyoto! Using a bicycle is one of the best ways to discover Kyoto. 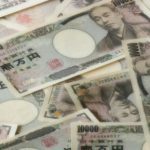 Why not hop on a rental bike and explore many fascinating areas of Kyoto far and wide, efficiently and at a very reasonable price.